I am a fan of the 3D popup books from StoryToys. The format is so appealing to younger juniors, StoryToys has been reusing it for their newer StoryToys Jr line of apps. The apps in the StoryToys Jr series are designed for juniors ages 1-3. 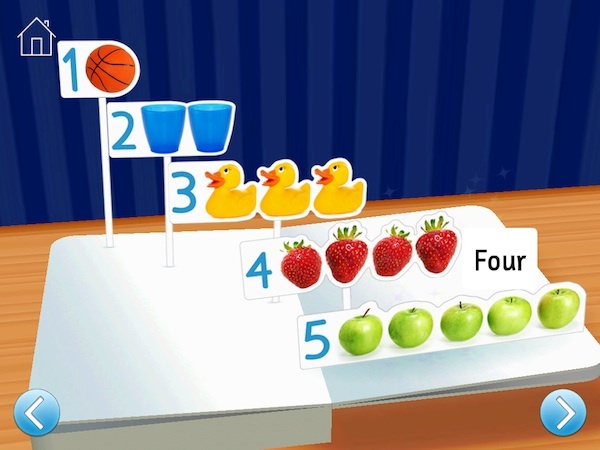 For example, Farm 123 features fun activities for learning about numbers and basic counting. Another app, Animal Band, is a lovely musical toy which plays popular nursery rhymes. Today, I want to highlight the latest addition to the series: Touch, Look, Listen: My First Words, an interactive app designed for juniors ages 1-2 who are learning to recognize new vocabularies through the use of photographs, short labels, and friendly narration. Play an object identification quiz at the end of the book. The book starts with a page showing a collection of farmyard animals such as horse, cow, chicken, and pig. Tapping on an animal will show the animal name, accompanied by a narration. Tapping it the second time will play the sound associated with that animal. The next page of the book shows a collection of jungle animals such as lion, elephant, monkey and crocodile. Juniors can also hear the animal sounds on this page. The other pages of the book do not include animals, hence juniors won't hear animal sounds on the second tap. Instead, they will hear sounds made by the related object. For example, when learning about parts of the face and body, tapping on the nose the second time would trigger a snorting sound effect. The contents of these pages are really interesting and easily relatable. For example, juniors can learn about members of their immediate family, and everyday objects they can typically found at home. The second half of the book lets juniors learn about different kinds of outfits, different types of breakfast meals, and utensils commonly found in the kitchen. Juniors also learn about vehicles and things commonly found in the park such as slide, ball, and tree. One of the last pages of the book even shows objects you typically encounter just before going to bed, such as toothbrush and pajamas. 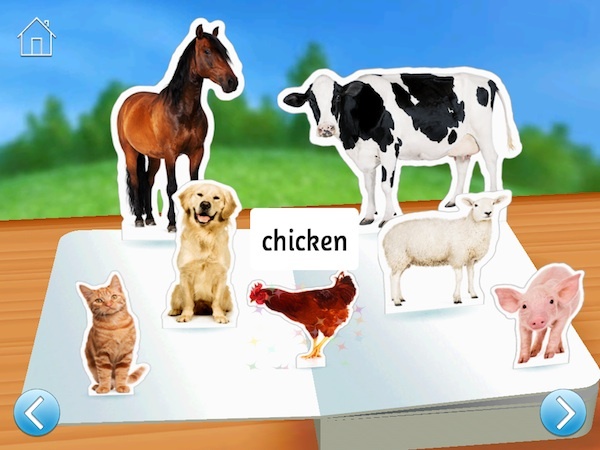 Learn about farmyard animals as well as jungle animals in Touch, Look, Listen app. The book also includes pages on colors and numbers. Juniors can learn a wide range of colors including white, black, brown, and purple, but they will only learn numbers from 1 to 5. This design decision clearly indicates that the app is designed for younger juniors ages 1-2. At the end of the book, you will find a quiz where juniors will be asked to identify one object from the page. For example, they may be asked to identify where the cat is, which shirt is brown, and what a sofa may look like. The app is designed for younger juniors ages 1-2 by introducing only the first five numbers. Similar to many modern apps for juniors, this app also supports five languages: English, French, German, Spanish, and Chinese. But this app offers something more: playing mode with two languages at the same time. For example, if you set up English as your main language and Chinese as your secondary language, you will see and hear both languages during playtime. The first time you tap an object, you will see the label and hear it pronounced in the main language. The second time you tap it, you will see and hear it in the secondary language. The third time you tap it, you will hear its sounds. This is very helpful for my four-year-old Philip who is learning Chinese as his third language. Hearing how a nose is pronounced in Chinese immediately after it is pronounced in English is really helpful. Juniors can also learn about members of their immediate family. Touch, Look, Listen: My First Words is a great app for juniors ages 1-2 to learn new vocabularies - especially ones that are popular among preschoolers. It's also a great tool for older juniors ages 3-4 who want to learn a second language.